BELMOPAN, Thurs. 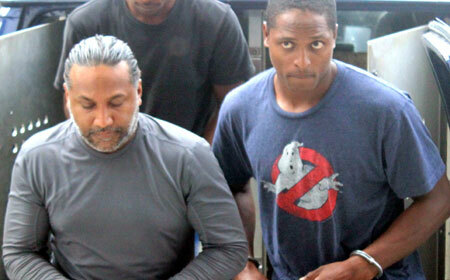 Aug. 11, 2016–William Donny Mason, the man at the center of one of the country’s most bizarre murders, was hauled out of his prison cell today along with three of his co-accused and transported to the Belmopan Magistrate’s Court, where they were arraigned on a charge of kidnapping of a Mennonite businessman and his wife. Mason, along with Keyron Fernandez, Aston Vanegas and Earnest Castillo, appeared before Belmopan Magistrate Emerita Anderson, who arraigned them on the new charge. The prosecution at the arraignment was handled by Assistant Commissioner of Police, Chester Williams, who is a trained attorney. The four men are on remand at the Belize Central Prison on charges of murder and kidnapping for the death of Pastor Llewellyn Lucas, whose head was found in a bucket in Mason’s vehicle in Belmopan. The beheading of Pastor Lucas has gripped the country’s attention like no other murder in recent times, and the allegations of money gifts from Mason to key elected politicians in the Barrow government have led to the stripping of the police portfolio from Minister of National Security, John Saldivar, who admitted to accepting around $50,000 from Mason for his Belmopan Bandits football club. Today’s arraignment is based on a complaint filed by Lloyd Freisen, a Mennonite businessman, and his wife, who were allegedly extorted by Mason and had to leave the country in fear of their lives. Friesen, a major grain producer, in Spanish Lookout, reportedly entered into an agreement with Mason, who had promised to import $300,000 worth of corn via Argentina. Friesen allegedly paid Mason the $300,000 for the corn, and when it did not arrive as the agreement stipulated, he attempted to recover his money from Mason. According to the narrative, Mason invited Friesen to his Inteco Hill house in Belmopan for a meeting. It was when they attended the meeting at Mason’s house that they were allegedly kidnapped by Mason and his associates and taken to Mile 31, where Mason has a ranch. At the ranch, Friesen allegedly was warned not to report the incident to police, and at the same time Mason allegedly began to extort $2,500 per week from the businessman. Eventually, Friesen left Belize and went to Canada in an effort to escape from Mason. Upon his return to the country, Friesen gave police a written statement of what had transpired between himself and Mason, before he left the country again, fearing for his safety.